Rocky Mountain (1950) | 50 Westerns From The 50s. Errol Flynn Westerns are a strange breed. Maybe the first thing you notice is the artificial-ness — Flynn’s displaced accent (hell, his displaced everything), the supersaturated Technicolor of some of them, Humphrey Bogart’s Mexican bandito in Virginia City (1940) and the earnest adventurousness of them all. They’re a bit on the surreal side, almost The Cowboy Of Oz. The Flynn Westerns work pretty much like this: if you like, say, Montana, chances are you’ll like the others. (I do.) Then you get to Rocky Mountain, Flynn’s eighth and last Western. Suddenly, things are very different. That difference isn’t just what you see on the screen. Hardly. Both the Hollywood and Errol Flynn of 1950 were quite different from just a few shorts years before. For one thing, the studio system was breaking down, and cost-savings were the order of the day. Out went Technicolor, large casts and lavish sets. Next, Flynn wasn’t the dashing young actor of old. His years of hard living were catching up with him. He’d be dead in less than a decade. Of course, the Western was changing, too. You can feel these harsh realities, this change, in almost every frame of Rocky Mountain, a grim, gritty little picture that stands as a clear, early example of what we now think of as a Fifties Western. They may have trimmed the budget, but they sure didn’t scrimp when it came to fatalism. It absolutely oozes from this film. It’s March of 1865. The Civil War is nearing its end, and the Confederacy needs a miracle. The weary Lafe Barstow (Flynn) has brought his men all the way to California in an effort to link up with insurrectionists, assemble a band of guerillas, and hopefully turn the tide of the war. However, this far West, they end up facing an enemy even more formidable than the Yankees: the Shoshones. Flynn and his men come to the aid of a stagecoach being chased by a Shoshone raiding party, a gallant act that will eventually seal their fate. The lone passenger turns out to be Johanna Carter (Patrice Wymore), fiancé of a Union lieutenant. Protecting the woman compromises their mission, and puts them in conflict with both the Shoshones and the Union soldiers looking for the missing stage. The vistas are striking, largely thanks to director of photography Ted McCord. A real veteran, who started out with Silent Westerns, McCord excelled at outdoor shooting, with a career that spanned everything from Ken Maynard riding into the sunset to Julie Andrews coming over the hill in The Sound Of Music (1965), certainly one of the most-revered exterior shots in filmdom. William Keighley spent the bulk of his Hollywood career as a contract director at Warner Bros. His list of 30s credits includes some of the studios best films: “G” Men (1935), Bullets Or Ballots (1936) and The Prince And The Pauper (1937). He was replaced by Michael Curtiz halfway through Flynn’s The Adventures Of Robin Hood (1938) — with that one, there’s still some debate about how much of Keighley’s work we’re looking at. More good movies preceded World War II — Brother Rat (1938), for instance. When the war ended, Keighley found himself at RKO. An excellent film noir, The Street With No Name (1948), came from that period. Then he was back at Warner Bros. for Rocky Mountain. A couple more pictures followed, including The Master Of Ballantrae (1953), which would also turn out to be Flynn’s final swashbuckler and Keighley’s last picture before retiring to Paris. His assured work on Rocky Mountain keeps things moving and tension mounting. Guinn “Big Boy” Williams, a frequent Flynn costar, was also on hand. 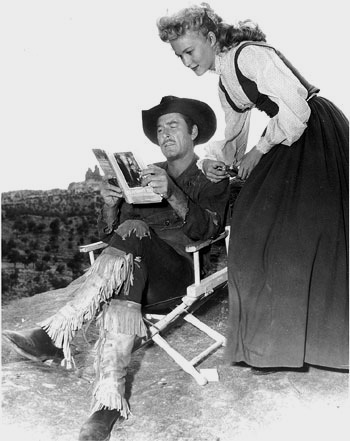 But what really generated buzz around Rocky Mountain was leading lady Patrice Wymore. She was 21, working on her second picture and engaged to Broadway producer Sammy Lambert. Flynn was 40 and engaged to a Rumanian princess, Irene Ghika. Both of those romances went by the wayside, and Flynn and Wymore were married shortly before the picture opened, which had to have made things easy for Rocky Mountain’s publicity people. And though they were separated, Patrice was Mrs. Errol Flynn when he died in 1959. Rocky Mountain is a good picture. It’s got a tough performance from Flynn — very different from his other Westerns, and turning his hardened looks into a benefit. It’s well written by Winston Miller (My Darling Clementine), from a story by Alan LeMay (The Searchers). It’s as much character piece as it is a cowboy picture, giving its cast plenty to work with. And it stands in marked contrast to something like San Antonio (1945), hinting at just where the Western was heading over the next 10 years. 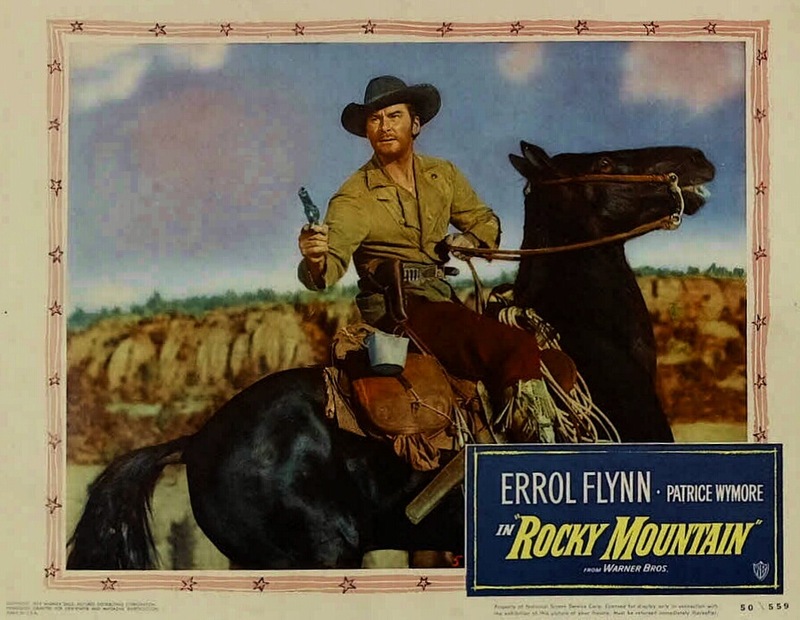 Rocky Mountain is one of four Flynn Westerns (he made eight) lavishly presented in the Errol Flynn Westerns Collection. The other three are Virginia City (1940), San Antonio (1945) and Montana (1950). Raoul Walsh’s Silver River (1948, their last picture together) is the only Flynn cowboy movie not on DVD. You can watch it here, however — and I recommend that you do. UPDATE 11/29/16: Rocky Mountain will be available as a single disc in January 2017 from Warner Archive. Not exactly the quintessential western actor, but I enjoyed Flynn’s westerns just the same, and I always found ROCKY MOUNTAIN interesting. I haven’t seen SILVER RIVER in years, but if I remember right Ann Sheridan (who always had good chemistry with Flynn–offscreen too, it’s rumored 🙂 is his leading lady. Flynns finest western a moving story of self sacrfice what an advertisment for the Confederate army,were they really fighting to preserve slavery? all very confusing to a 10 year old English lad as I was when I first saw this film 60 years ago. When Flynn and his command of 7 made there last desperate charge and gave there lives to to save others with the the sound track playing DIXIE the whole cinema stood up and cheered and we were all English.We were unaware of the big issues and causes of the Civil war but we knew a good film when we saw one!! I saw this movie as a young boy of eight, (fifty years ago). It was a Sunday afternoon and I was enthralled. “They’ve seen our backs, now let’s show them our faces”. I realised that they were going to suicide charge their enemy with no hope of winning through. I cried and cried at the inevitable result as the Cavalry arrived just a bit too late. And they flew the Confederate flag above the site.